Because I can and because I’m pretty good at it and because I’m at my happiest when I’m running. Realizing around mile 13 at Boston that I didn’t have to work hard – that it was time to enjoy what I earned. I stopped trying to race it and just laid back and enjoyed the crowd. Since I spend many hours a week coaching and teaching others to be active, pacing is a natural extension. 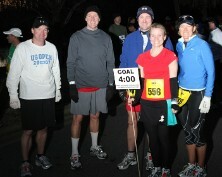 Plus when I pace, I actually get a chance to enjoy the race. 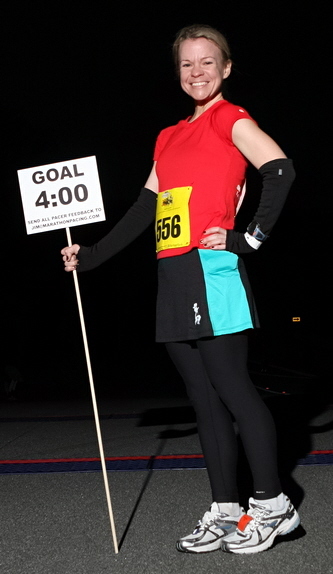 Having a nice, sympathetic man tell me that even though I was over by 2 minutes, when, really I came in 39 seconds under at Minneapolis, I “did really good!” I don’t think he realized we pace off our chips, not the official race clock. I have good jokes, I smile a lot and I can talk non-stop for hours. I’m also cute. Say hi! And please feel free to carry my sign! It’s fun! 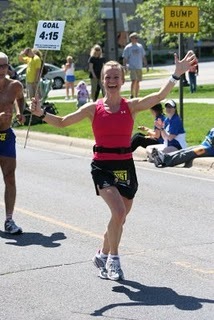 My laughter is contagious, even at mile 19, I swear!